Any crime novel that crosses the 300-page mark must have an interesting plot that keeps me turning pages. In fact, it needs to start off with a great hook in order to convince me to keep reading. I blame that on the plethora of superb, taut, bloody, impeccably written novellas and short story collections I've read in the past year or so. 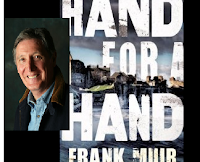 In any case, Frank Muir's Hand For A Hand managed to keep me interested and surprised for its duration, so it merits a read. The story starts when a dismembered arm is found on the Old Course in St. Andrews, Scotland. The arm's hand is clutching a crumpled note with the word "murder" written on it. Detective Chief Inspector Andy Gilchrist is called to the scene and soon learns the puzzling, bloody note is addressed to him. It doesn't take him long to realize that a killer is trying to send him a message. Gilchrist wants to solve the grisly murder quickly, but the severed arm is only the first of his problems. For starters, his boss had paired him up with a detective with whom Gilchrist share a dark, violent history. Also, his son’s girlfriend is missing and his ex-wife, who he still misses but never talks to, is very sick. As detached body parts continue to appear and the message being sent becomes clearer, Gilchrist realizes that his current problems are nothing compared to what the killer has in store for him. Muir has a knack for twists and turns, turning his plot into a steady stream of unanticipated events and revealed secrets. However, what makes Hand For A Hand and enjoyable read is Gilchrist. The character is flawed, but he demonstrates a relentless work ethic that's admirable. While he's far from being one of those Holmes-like detectives that immediately cracks every case, Gilchrist keeps at it, forgoing meals and sleep, until most of the fog is lifted from each new clue. Ultimately, this personality trait, coupled with his honesty and the amount of suffering he has to endure, make the detective a likeable, enduring character. The second reason why Hand For A Hand works is its author's ability to transport readers with his prose. Whatever Muir lacks in character development and back story, which is not much to begin with, he makes up for by richly describing Scotland. One of the best things about SOHO Crime is that it takes readers on trips to every corner of the globe, and this tome is very successful at that. Through Muir's writing, you can feel the cold and the wind, smell the ocean, and end up craving a pint or three. Although this novel is the second in the series, I never felt lost. This is the first Muir text to be released in the US, and more are sure to follow. 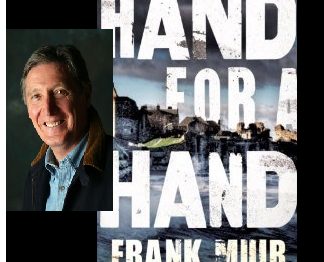 The combination of tension, emotional distress, and gore make this a great introduction to Muir and a recommendable addition to SOHO Crime's already impressive catalog. Gabino Iglesias resides in Texas and is the author of Gutmouth.